Who can benefit from the Davis Dyslexia Correction® Program? Anyone who possesses dyslexic characteristics and is self-motivated to improve their abilities. What kind of gains can a client expect to make? It’s fun. Many other programs only address the symptoms of learning disabilities and involve a lot of repetition, which can be boring and tedious to dyslexics. The Davis methods address the root cause of learning disabilities and draw upon the natural strengths and talents of the individual’s thinking and learning styles. 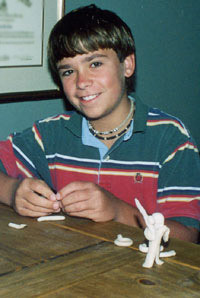 For example, clients use clay to create symbols, words and concepts. It’s this sort of kinetic, active learning that makes the Davis program so successful. The client should master the entire list of 217 trigger words. They can be completed over several months or longer depending on the frequency of the Symbol Mastery tutoring sessions with a family member, friend, or tutor. These same techniques can also be used to master any word, concept, or subject. Follow-up support is also included as part of the program and consists of a Student Symbol Mastery Kit, Support Training for client helper(s), telephone consultations, and up to three two-hour return visits, as needed. How much gain in ability can on be expected? There is usually a marked difference by the last day of the program. This is a literacy jumpstart. Future progress is determined by an individual’s motivation and continued use of Symbol Mastery and program tools after the session. Can a person lose his/her natural abilities after the program? No. The Davis Methods utilize the client’s strengths. It unleashes the ability to learn more quickly and thoroughly. In fact, their natural abilities are often enhanced.